As you may have seen in my gallery of badges below, I’m proud to be a member of Staedtler’s Try It Tribe. Earlier in the school holidays they sent us an amazing bundle of craft supplies, including colouring pens, crayons and gel pens. which we’ve been using throughout the summer to help us with our fun craft activities such as our beach themed sensory activity. 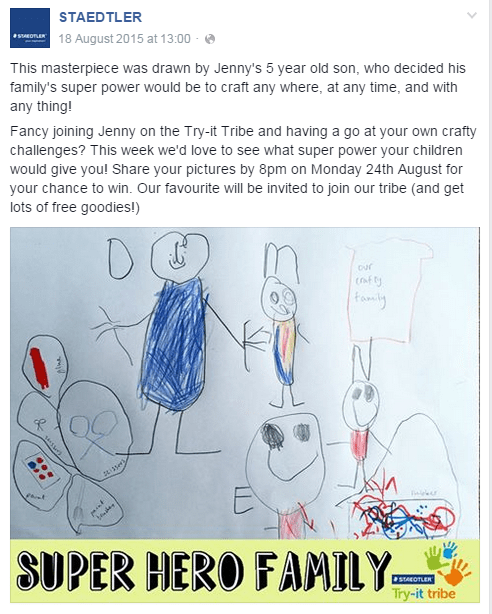 Every week on the Staedtler Facebook page they are setting a weekly challenge and the winner will become the next member of the Try-it Tribe. More information can be found here. The latest challenge was to see what super hero power your children would give you. My 5 year old had great fun drawing me using the Staedtler Noris colouring pencils. In fact he added us all and decided we were all a very crafty family and never go anywhere without our favourite craft supplies. Today we were featured on Staedtler’s Facebook page.